It's nearly Spring, and that (stereotypically speaking) means plenty of pastels. While canary yellows and baby blues are soft and romantic, pink can be troublesome as it easily veers into Barbie territory — especially when worn head-to-toe. But leave it to music's earthy goddess to make the wrong all kinds of right. 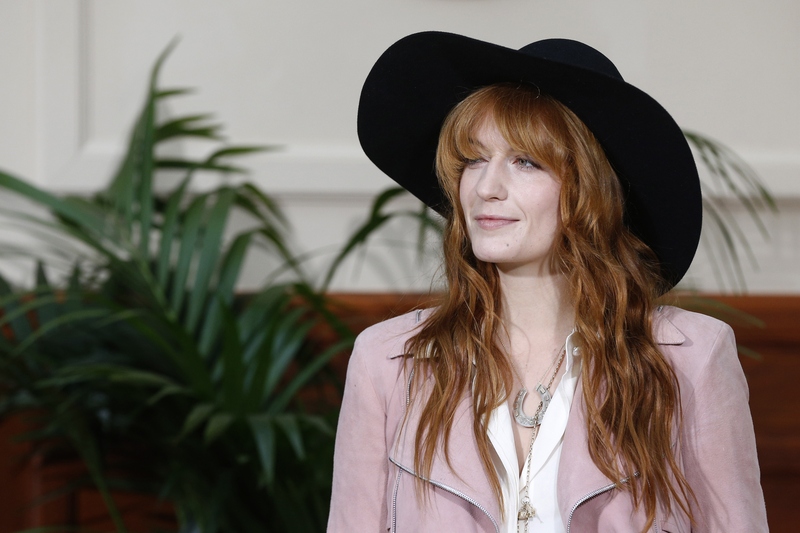 Florence Welch wore a pink suit to Chanel's show at Paris Fashion Week, and quite possibly stole the show from the models on the runway. Welch, whose style mixes elements of edgy, bohemian, a hint of the 70s, and just a whole bunch of laid back, cool, took an uncharacteristic risk and wore an all pink suit in the Chanel front row. The dusty pink Chanel suit, with a high-waist, wide-leg pant and slouchy jacket, was from the 2015 spring collection. She paired it with a loose, white shirt, studded black booties, and a black floppy hat. With her red hair in messy, undone waves and minimal makeup, the British singer made the feminine color so rock and roll. Not only did the 28-year-old pull off a difficult color, she also pulled off a pretty tricky silhouette to wear, though I'd expect nothing less than floaty, quirky perfection from indie rock's queen.